In June 1978, as stated ultimately by the California Supreme Court, while I was planning the Butler kids rescue (Escape from Synanon 3), 27-year-old David Molko graduated from Temple University School of Law, passed the Pennsylvania bar and decided to visit San Francisco, arriving in early January of 1979 while cults were big news following the events of Synanon and Jonestown. Thus he was on the alert for those seeking to proselytize. On Sunday, January 21 Moonies approached Molko as he waited at a SF bus stop and said they were socially conscious people living in an “international community” in order to discuss important issues. They invited Molko to come to dinner. Molko asked if they had a “religious connection.” They said “no” and did not reveal to Molko that they were members of the Unification Church, or that their purpose was to recruit him into the Church. Molko attended the dinner, which included a number of other targets. He was kept apart from the other guests, and held in constant conversation with group members. After dinner there was a lecture on general social problems, followed by a slide show on “Boonville” — a “farm” a few hours to the north, owned by the group at the house. The slide show depicted Boonville as a rural getaway where people from the house went for relaxation and pleasure. When the presentation was concluded, all the targets were invited to visit. The group members assured Molko they would provide for all his needs. Impressed by this hospitality and enthusiasm, Molko agreed to go, not knowing his destination was an indoctrination facility for the Unification Church. Molko was given a sleeping bag and a shelter where others were already sleeping. He awoke the next morning finding more than just the 12 from the van were sleeping in the room. When he walked to the bathroom, a group member arose and walked with him. Wherever he went, a group member attached. Molko day’s schedule left him no individual time. There were group calisthenics, then group breakfast, then a group lecture on moral and ethics. After lunch was, more exercise and more lectures. After dinner, there were“testimonials,” group singing and more group discussion. At the end of the day Molko was exhausted. Molko asked the name of the group, and was told it was the “Creative Community Project.” He was told it associated with no religious organizations. By the end of Tuesday, Molko, tired amd uncomfortable, informed he desired to return to San Francisco. They told him he was free to leave but the bus departed at three o’clock in the morning. They strongly urged him to stay and hear the important information that would be discussed. Molko agreed to stay a little longer. The days that followed were the same: lectures were repeated verbatim. They spoke of brotherly love and social problems, and included references to God and prayer. On Wednesday, Molko was informed the group’s teachings derived from many philosophical sources, including Aristotle, Jefferson, and Reverend Sun Myung Moon. It was not disclosed that Reverend Moon was the group’s spiritual leader. On Friday night, Molko was told the group was about to leave Boonville for “Camp K” — another group-owned retreat used on weekends. Molko said he wanted to return to San Francisco, but again was urged to give the group a few more days. He agreed and made the trip to Camp K, still oblivious of his involvement with the Unification Church. A weekend of exercises and -lectures continued at Camp K and then he was back at Boonville, during which Molko became increasingly disoriented and despairing of his future. On his 12th day of continuous group activity Molko was told for the first time the group was part of the Unification Church. While confused he was told the deception was necessary because of all the bad stories about the Church. He agreed to stay and try to work out his confusion. That night he returned to Camp K, where he remained for approximately five to seven weeks of “advanced training.” The same regimen and structure continued. Molko’s parents flew in from Florida. They stayed a week, but saw their son for only a few hours, and only in the presence of Church members. The parents urged him to come home briefly, but he refused. Molko — who by this time had been taught that his parents were agents of Satan trying to tempt him away from the Church — was confused by the visit and remained with the Church. After more advanced training at Camp K, Molko was deemed fit to go to the city to sell flowers and “witness” for the Church. He donated $6,000 to the Church. Church leaders advised Molko he could help the Church most by becoming a member of the California bar, and promised that the Church would pay for his bar review course. He agreed, and studied for and took the California bar examination while living in the Church’s San Francisco house. As he left the final session of the bar examination, however, Molko was abducted and taken to a motel by “deprogrammers” hired by his parents. After three days of deprogramming, Molko terminated his association with the Unification Church. A year after the recruitment of Molko, in June 1979, 19-year-old Tracy Leal, daughter of trial attorney Stanley Leal, completed her freshman year at San Diego State University. Finding the college impersonal; she considered transferring to Humboldt State University in northern California and set out to visit the campus. She had to change buses in San Francisco and while waiting Leal was approached by Unification Church member witnessing for the Church and lured, similarly as Molko, to the church (see Molko v. Unification church for details). After two days at Boonville, Leal went for a two-week seminar at Camp K. During this period she experienced the same doubts and fears Molko and again asked if the organization was “part of the Moonies.” They assured her it was not but later added that they did follow some of the teachings of Reverend Moon. Five days later, twenty-two days after recruited, Leal was told they were in fact part of the Unification Church. Like Molko, she remained with the group after learning its identity. During the next two months her family visited her and tried to convince her to leave. She feared being abducted and deprogrammed. On September 1 Leal flew to Boulder, Colorado, for a month of advanced lectures. From there she went to Los Angeles, where she sold flowers on the street to raise money for the Church. On October 29, Leal was abducted from a Los Angeles street by deprogrammers hired by her parents. The deprogrammers successfully persuaded Leal to abandon her association with the Unification Church. One of the deprogrammers was David Molko. Both Molko and Leal sued the Moonies for fraud and damage from brainwashing. The Church filed a first amended cross-complaint against Molko and Neil Maxwell, alleging their deprogramming activities violated the Church’s federal and state civil rights. While I was engrossed proving Richard Corriere and Joseph Hart had brainwashed, used and abuse patients in a therapeutic community (See Escape from Center for Feeling Therapy), Molko and Leal lost their cases on summary judgment and the rulings were affirmed by the Court of appeals. Given Synanon and events of Jonestown, the issue of brainwashing was ripe for judicial review but right now the ruling was the claim could not be made against a religion as it would violate freedom of religion. It appeared that before I would ever get the issue into the appellate courts the cause and my career had been lost. While I had alleged brainwashing against Synanon, People’s Temple and Center for Feeling therapy the position of the nation’s courts was unclear. It had been raised as a criminal defense by Patty Hearst (but jury did not buy it) and in a 1977 Appellate case Katz vs. Superior Court, also involving the Moonies, it had been correctly ruled the mental state of an alleged brainwashed person did not fit California statue criteria for involuntary conservatorship or treatment. The court of appeal in Katz also added in dictum (language unnecessary for the ruling) such an inquiry would violate the First Amendment freedom of religion guarantee by unlawful inquiring into the validity of beliefs. While I had plead causes of actions for brainwashing I always made sure there were other winnable claims that would succeed independent of whether victims were brainwashed or not as I did not know if the higher courts would say if charges of brainwasing were lawful claims or not. They might say as against a religion it is protected activity or might conclude coercive persuasion is just theory, not a fact upon which a tort claim could be made. Katz was always the warning my view might not be the popular one. Protecting religion was in the Bill of Rights, and most people prefer to think that something like brainwashing was not out there and could not threaten their autonomy. Making matters more difficult, the movie Manchurian Candidate suggested wrongfully a victim was a zombie robot waiting for instructions on who to kill. In Katz, the trial court, listening to Dr. Magaret Singer explain brainwashing, bought it and had granted parents conservatorships over adult children in the Moonies. By the time the appellate court had said this was wrong 3 of 4 had deprogrammed. One wrote a book on the experience. The one who returned to the Moonies had been said to have the most psychological issues. The legislature never looked at the positive results from the granting of the guardianships and the fact the Appellate court decision blocked this avenue of rescue for the future. Law makers ignored the issue all together. Thus the Katz dictum while not binding (not necessary to the ruling) could still be cited. Molko and Leal Trial Judges included Charles Pollack and the highly respected Ira Brown, Jr. Brown Jr is considered one of the most powerful and influential judges in San Francisco history. He was no stranger to me. He spent five years overseeing the distribution of the People’s Temple assets, following the 1978 mass murder-suicide in Guyana in which 913 people died. I was one of the lead attorneys for families of victims, flying in from Los Angeles for court hearings. Molko and Leal sought to introduce the declarations of psychologist Dr. Margaret Singer and psychiatrist Dr. Samuel Benson stating they believed the Unification Church’s sophisticated indoctrination techniques had rendered Molko and Leal incapable of exercising their own will and judgment, or of responding independently upon learning of their deceptive recruitment. Singer’s testimony had been accepted by the trial court in Katz before that ruling was overturned. The Molko and Leal Trial Judges found a conflict between plaintiffs’ statements they joined the Church because it satisfied “personal concerns and anxieties” and Singer’s and Benson’s statements that it was plaintiffs’ unawareness of the Church’s identity that caused them to stay. The appellate court confirmed, and once more upholding the Katz dictum that such a lawsuit would be an unconstitutional inquiry into validity of religious beliefs. Whatever precedents I might have set in local courts and in the media might now be irrelevant. Brainwashing (thought reform) at that moment was no longer actionable against a religious entity. There is an old saying bad facts can make bad law. Equally true is if lawyers do not frame the matters correctly bad precedents can be shaped. In my cases my clients when asked a question of why they did something as a cult member were instructed to make it clear that if the answer included a belief compelling there actions that was taught by their handlers and was not something they now believe (if that be the case) they must say that. It is important to explain if they were acting from their own belief or a forced new belief. There were to testify in a manner that makes clear what they thought before subjected to thought reform, what they thought during exposure and what they think today. There could be as many as 3 answers to same question, maybe more. They had to make that clear. The trial courts and court of appeal in Molko/Leal ruled the fraudulent concealment of Moonies identity per their doctrine of Heavenly Deception (it is ok to lie if it serves God) was irrelevant because when Molko and Leal found out it was the Moonies they stayed out of personal reasons; so they did not rely on the fraud. From reading the discussion of their testimony it appeared the courts had not seen the context of their answers, which was not necessarily clear, i.e. their personal reasons from which they choice to stay were what they were brainwashed to believe. It did not appear that a real good record was clearly put forth to frame the issue–At least Judge Brown, Jr. and Pollack didn’t get it. Molko/Leal joined due to their beliefs induced by the environment while fraudulently seduced to remain in the environment unknowingly exposed to forced indoctrination. By lying, Moonies got Molko and Leal to stay at camp. There damage was done, i.e., they were brainwashed to believe they needed to stay for their own betterment. The Judges failed to understand there ruling was an award for a successful devious plan. And it may be because at deposition Leal and Molko did not make the context clear. As to Katz dictum, it was wrong. Examining how someone came to believe something does not involve deciding whether belief is valid or true. The “beliefs” were not on trial, the indoctrination system was. The prior Judges, in my view, failed to see big picture. I was surprised that Judge Ira Brown didn’t see it. I told him once I would burn my bar card if I could not prove brainwashing at Jonestown. By failing to see Leal’s and Molko’s beliefs that they wanted to be Moonies were instilled while they had been falsely led to indoctrination camps, the courts had given the Unification Church immunity– a reward for having succeeding in brainwashing and fraud. I contacted Leal and Molko’s attorneys Stanley Leal and Ford Greene. I offered my services and helped Leal write his Writ asking the California Supreme Court to accept the case. Greene wrote his own. While parties have the right to appeal, no one has right to appeal to California Supreme Court. You must convince the High Court that there is an important legal or social issue that is unclear in law and needs a conclusive decision. The Supreme Court agreed to hear the case. Greene was specially equipped for the job. After farm days chucking hay, milking cows and unclogging sewers at Straus Family Creamery, he took off backpacking which included climbing 16 14,000-foot peaks in three months. But then in l974 his sister Catherine, 18, disappeared. It turned out she was in a Unification Church camp. Greene went to the Boonville camp a few days later to confront Catherine, but she was always surrounded by Moonies. A church leader invited Greene to attend a training session. Greene went to hear Moon speak in person at the San Francisco Opera House and thought Moon sounded “Hitler-like” but also felt a calm afterward. He went to the training camp and was exposed to Moonies “love bombing.” Although images of Hitler Youth kept popping into his mind, he says church leaders poured on the love when he confronted them about the program – a strategy that helped reinforce the power structure and created self-doubt. Blaming it on a typical young low self-esteem, Ford, in his effort to rescue his sister, himself, became a Moonie in 1974. But after 8 months he was bothered by their belief that anyone against the church was of Satan. He figured things out on his own and not only left, but became an outspoken critic and a cult deprogrammer. In 1976 Ford testified in US Congressional hearings on Rev. Moon. To further the fight he went to law school so he could to take the battle to them in court. But sadly he was never able to get his sister out of the Unification Church despite years of trying. Ultimately she was married in South Korea in one of Rev. Moon’s mass weddings. From 1976 to ’78 Greene deprogrammed Moonies, including the Prince of Tahiti with the cooperation of the royal family. He is mentioned in Josh Freed’s book “Moonwebs.” He was prosecuted in Colorado but charges were dropped because government authorities had hired him. His biggest failure was an attempt to deprogram his sister. She sued Ford and her family, who then had to accept she was gone, out of their lives as if buried. While he did not have a bachelor’s degree, Greene was enrolled in the New College of California Law School in 1978, deciding the court room was where to be go after the new Adolf Hitler. This was the battle front. This was the place and time the issue would be decided. Was brainwashing a provable fact, and if so was it protected by the first Amendment? Religious groups like Scientology and Synanon were backing the Moonies, Amicus briefs filed by many religions. Former California District Attorney Robert H. Philibosian filed one for the The American Psychological Association, urged by members with certain affiliations, claiming brainwashing was an unproven theory. Philibosian was familiar to me. He was selected DA after John Van de Kamp was elected Attorney General. Philibosian, despite my protests, dropped interest in Synanon. The APA later withdrew their brief. On our side, it was Greene, Leal and me. California and New York are highly valued legal systems and most states will defer to their rulings. Already a New York court had ruled against a brainwashing argument on the basis of Molko appellate ruling, even though it was going to be heard again by the Supreme Court. So this case was going to be the decider whether the record was as I would prefer or not. I wished it had been one of my cases, because I knew then the testimony would have been free of ambiguity. If the California High Court convinced of brainwashing allowed suits, it could change society as brainwashing camps to a large extent might be eliminated in fear of paying damage suits. It would give validation to need for education. If California was not convinced, thought reform regimes could multiply and spread without fear of retribution. Also my career hung in the balance. That this ultimate case to determine the legal issue if one could sue for non-consented brainwashing involved the Unification Church may have in of itself been justice. While there were early problems with Children of God, some say it was Rev. Moon who transported Mao Tse Tung’s thought reform process to the West. Moon was born in 1920 in Sangsa-ri Deogun-myon in North P’yŏng’an Province ( North Korea) then under Japan’s control. . He was one of thirteen children and the second son to a scholar and homemaker. When he was a child, Moon’s family went into bankruptcy which may have led Moon to preoccupation to amass wealth. The family held traditional Confucianist beliefs, but converted to Christianity and joined the Presbyterian Church when Sun was 10 years old. At 15, Moon said while praying on a mountain top Jesus told him he was selected to bring God’s kingdom to Earth. After the end of World War II he returned to Korea and began preaching his own interpretation of the Bible. He was arrested in 1946 by North Korean officials and claims the police beat him and nearly killed him. His theories, the Divine Principle, appeared in 1946, not long after my birth, and an expanded version was published in 1957 when I was 12. Sun Myung Moon was given a five-year sentence in 1948 to the Hŭngnam labor camp where prisoners were exposed to affects of Mao’s re-education thought reform programs eventually studied by Dr. Robert Jay Lifton (who named it “thought reform” and Dr. Margaret Singer. He was released from prison with others with the advance of Western forces during the Korean War . He then started to build his church. In 1954, he founded the Holy Spirit Association for the Unification of World Christianity in Seoul (the Unification Church). By 1955 he had 30 church centers. In1958 Moon sent missionaries to Japan, and in 1959 to the United States of America. In 1971 Moon came to the United States, which he had first visited in 1965. His teachings were anti-communism and sought to end state-church separation. In 1974 Moon sought political favor by gambling on President Richard Nixon surviving Watergate. Followers prayed and fasted in support of Nixon for three days in front of the United States Capitol, ala Manson followers had outside the Criminal court’s building during Charlie’s trial, and received back Nixon’s public thanks. Had not Nixon resigned and had he beaten impeachment, this may have been the start of the real Manchurian Candidate. Moon also gave a series of political speeches to audiences in the 70’s at Church events filled with fireworks and music. By 1975, Moon had his followers recruiting in 120 countries. 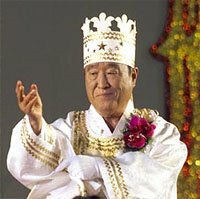 While my introduction into the world of cults began in 1977, that same year Congressman Donald M. Fraser produced a report that included 81 pages on “the Moon Organization,” contending the Unification Church was a political tool and propaganda outlet for KCIA within the United States and that some Unification Church members worked as volunteers in Congressional offices. Fraser’s committee also investigated KCIA influence on the Moon support of Nixon during the Watergate scandal. Robert Boettcher, the staff director of the committee, in his book Gifts of Deceit: Sun Myung Moon, Tongsun Park, and the Korean Scandal wrote of reported what he described as financial corruption. The church it was reported had engaged in munitions manufacturing in South Korea beginning in the 1960s and owned the Tongil Group which was involved in weapons manufacture, producing M16 rifles, antiaircraft guns, and other weapons. In l980 Moon’s newspaper New World, seeking more clout, celebrated Ronald Reagan’s landslide victory. Appealing to Regan’s anti-communism, Moon sought Reagan support. Church funds in 1982 were used to start The Washington Times. But by 1982, despite the political moves, society, due in part to the 1981 movie Ticket to Heaven (based on a story in which Ford Greene was the deprogammer) was weary of Moonies. Moon was convicted by the U.S. government for filing false federal income tax returns, an IRS target ala Al Capone and Charles Dederich. He returned once again to prison, this time for 18 months in the Federal Correctional Institution in Danbury, Connecticut. Moon’ son, Heung-Jin Moon, died in 1984 from a car crash in December 1983. It was alleged he returned in the body of Cleopas Kundioni, a Zimbabwean member of the Unification Church. The “Black Heung” became a Church big shot, some calling him a new Christ. But allegations were made this new son of God traveled the world administering beatings to those he believed violated church rules, while amassing a harem of mistresses. It was said he beat a man in his sixties, Bo Hi Pak , bad enough to hospitalize him for a week. Some accused Moon of enjoying the beatings. Pak was a Lieutenant Colonel in the South Korean military when he joined the church in the 1950s becoming Moon’s top man. Dr. Margret Singer, who had studied thought reform applied in Korean prisons, and then observed similarity of experiences in young Americans exposed to Moon recruiting camps, always pointed out Pak was involved in carrying out thought reform for Mao in the Korean camps and the probable source for Moon’s know how. Stanley Leal represented his daughter Tracey, but this was not his area. But it was Ford’s. At first, it appeared I could do nothing as I had a long trial coming up in the Hart defamation case (see escape from the Center for Feeling Therapy) which I expected to last about 3 months in which I was not going to be paid (although we had received a big settlement in the companion plaintiff’s case). This defamation case was a tactic, and not a bona fie suit, and I was willing to go through it for free to get to the malicious prosecution action that would go after the therapist and their lawyers for bringing it against former victim patients to induce them to not to proceed with their valid claims of psychological malpractice and tyranny. I tried to find a law firm to get involved in Molko pro bono and, using me as a guide, write an Amicus brief (friend of the court) for CAN (Cult Awareness Network), an organization storing and releasing information on what it called “destructive cults.” Upon application a person or organization showing by nature having an interest in the outcome of the case can request and obtain permission to provide a written argument to the court as to how it should rule, generally based upon public concerns. I had not found a firm yet to commit when it turned out we won the Hart action proving in pretrial motions that there was no basis for the defamation lawsuit. I filed my malicious prosecution action but that quickly settled. What I had in front of myself now was a rare free time period. And as I was going to try the Hart action for free, and now I didn’t have to, why not do the Molko brief myself pro bono?
. Ford hit hard on presenting the facts of the case and proving the record was sufficient to support a finding of brainwashing. He put forward the context in which Molko’s and Leal’s comments should be seen—not as admissions of wanting to join for personal reasons, but proof of what they were brainwashed to believe. What I planned to do was address not so much the facts of the case but the concept of whether or not brainwashing was real and should there be a right for a victim to sue for it. Thus by my argument, even if the courts felt the record favored determination Molko and Leal later joined for personal reasons, I argued the court should go on and say what the law should be if they had not, i.e. were brainwashed to join. This turned out to be unnecessary because Ford did his job. Leal had less background. But he did bring something of great value. He had been the suffering father who had to arrange for the kidnapping-rescue of his own daughter—now the Plaintiff. He made the ordeal real. When he spoke before the court, how could sympathy not reign. Without saying it, he communicated this could happen to anyone, even lawyers or judges. Who next wants their child taught parents are of satan? Some laws are judicially made; they arise out of legal decisions, not statues, as an inherent right. By example, a legal journal publication arguing that we all should have a protected interest in our privacy ultimately led to judicial decisions defining our privacy rights and established when people could sue for having them trampled. Now we were trying to get the high court to establish an inalienable right to be free of coercive persuasion and to sue those who would implement such a regime without consent. To do this, myself, plus a young lawyer who just graduated Pepperdine, Tony Ellrod, spent months in the Pepperdine law library locating every case ever, state or federal, that addressed the issue of brainwashing. We did not have then the luxury of computer searches. We had to go through subject matter file cabinets, keyword books and the process of shepardizing decisions. This meant taking the case cite and searching through “Shepard’s” (books) to find other cases in which that case was cited in. We would then do summaries of the facts and rulings of each case. We were also blessed that as in the case of the right of privacy, there had been many treatises written in legal journals arguing that brainwashing was an evil and a civil remedy was necessary. The best was in my alma mater, USC, journal written by law professor Richard Delgado. These writings can also be brought to the attention of the court in briefs. So what was crafted was a brief summarizing all prior decisions on brainwashing, arguments that the ones supporting the claims made more sense, pointing out the errors of the others and summarizing the arguments of others who had tried to bring this phenomena to the public’s attention before I had. Also, I knew I had to address the Katz dictum, and point out that it was fundamentally wrong. To examine a process of conversion did not involve inquiry into whether or not a belief was valid anymore than when the examinations of whether or not the prisoners of war in Korea were subject to brainwashing involved an inquiry into whether or not Communist dogma was valid. It was not the validity of the belief that was at issue, but the method of inducing the belief. The belief was irrelevant. We worked for approximately 2 and ½ months. “While some individuals who experience coercive persuasion emerge unscathed, many others develop serious and sometimes irreversible physical and psychiatric disorders, up to and including schizophrenia, self-mutilation, and suicide.” (See generally Delgado, Religious Totalism: Gentle and Ungentle Persuasion Under the First Amendment, supra, 51 So.Cal.L.Rev. 1, 10-25. Legal cases that recognized its existence were cited, such as the Minnesota Supreme Court in Peterson v. Sorlien, supra, 299 N.W.2d at p. 126. The free exercise clause protects religious beliefs absolutely. (Cantwell v. Connecticut, 310 U.S. at pp. 303-304 .While a court can inquire into the sincerity of a person’s beliefs, it may not judge the truth or falsity of those beliefs. (United States v. Ballard (1944) 322 U.S. 78, 86-88. Religious motivated conduct is not protected. If the conduct is a crime, injurious and/or against public policy it can be banned or subjected to suit. (Sherbert v. Verner (1963) 374 U.S. 398, 402-403; Reynolds v. United States (1878) 98 U.S. 145, 166 [upholding law against polygamy]; Prince v. Massachusetts (1944) 321 U.S. 158 ; [permitting state to prohibit parents from allowing their children to distribute religious literature when necessary to protect children’s health and safety]). Next, I provided a list of cases that allowed to sue (torts) for religious practices that were secular in nature and harmful, even if religiously motivated. Malloy v. Fong (1951) 37 Cal. 2d 356, 372 [religious corporation liable for negligent driving by employee].) O’Moore v. Driscoll (1933) 135 Cal. App. 770, 778 [allowing priest’s action against his superiors for false imprisonment as part of their effort to obtain his confession of sins]; Bear v. Reformed Mennonite Church (1975) 462 Pa. 330 [allowing action for interference with marriage and business interests when church ordered congregation to “shun” former member]; Carrieri v. Bush (1966) 69 Wn.2d 536 [allowing action for alienation of affections when pastor counseled woman to leave husband who was “full of the devil”]; Candy H. v. Redemption Ranch, Inc. (M.D.Ala. 1983) 563 F.Supp. 505, 516 [allowing action for false imprisonment against religious group]; Van Schaick v. Church of Scientology of Cal., Inc. (D.Mass. 1982) 535 F.Supp. 1125, 1135 (allowing claims based on secular fraudulent misrepresentations by alleged religions.). As to Katz, it was pointed out this was not a case by parents claiming children were brainwashed nor of allowing guardianships that could open the door to any parent seizing an adult child, but former members themselves complaining of fraud. Allowing in action here opened no door, but might close one for deceptive practices for which nothing good was gained by allowing (unless you believed Moon that deception was good if it served God). “I found the argument tightly integrated, the case research exhaustive (you don’t miss much, do you?). And the whole persuasive. There are many points and analytical distinctions that I admired– absolute brief. I plan to keep to refer to in case I return to scholarship in the area of cults sometime. My brief almost never saw the light today. While Prof. Delgado wrote his praise, my client, CAN, canned me. They sent the brief to their New York attorney Herbert Rosedale who decided it was too long and analytical for an Amicus Brief. Lawyers, always think they can do better and Rosedale dashed out a quickie 8 page or so policy argument without any legal analysis or case review. If there would be a victory, he wanted the credit. He wrote CAN his brief is all the justices want from Amicus. They didn’t want, he said, an analysis and legal argument. Rosedale failed to understand the prior precedent against us and the uphill battle to overturn it. There were reasons for the plan, and it was over his head. Where I separated in this field was knowing general lawyer practices and beliefs had no applicability in cult cases. But Rosedale believed he knew better and decided to take over after Tony Ellrod and I spent 2 and a half months working on it. Rosedale subbed in, I was snubbed out. I had a brief I believe could save the day but no client upon which I could present it. I then called Henrietta Crampton who saved the day. A member of CAN she was also president of it predecessor Citizens’ Freedom Foundation, another anti-cult group. While I would never agree to be on the board of any such groups, fearing their own polarization and kidnapping involvement, I always gave advice and would speak at various events. Ms. Crampton used me more than most and I developed a friendship. I told her what Mr. Rosedale had done. Not only would my brief not be read, but I had no client to justify my appearance at the hearing. I asked her to trust me, not Rosedale. I said my brief was needed. I asked her to hire me to do the Amicus for Citizens’ Freedom Foundation. She agreed. She decided to go against CAN and Rosedale. I then filed with the Supreme Court notification I was no longer the attorney for CAN but was for Citizens’ Freedom Foundation which was now requesting permission also to file its own Amicus brief. CFF had evolved from organization of various cult knowledgeable persons following Synanon and the People Temple’s events. The Supreme Court granted the application. It was all unsual but in the end I think the court wanted to hear from me. The brief would be filed. As an Amicus, I have no standing to participate in the oral argument of the case. I represented no party. So I asked attorney’s Ford Greene and Stanley Leal for their trust. In appeals each side is allotted a specific time for argument. The Appellants also get time to rebut the argument of Respondents. I asked Ford and Leal to give me their allotted rebuttal time. I told them I was better at rebutting than opening argument. That I could quickly think of analogies to discredit arguments; that given public knowledge of my fight against Synanon–and every one knew they tried to kill me– I was the right guy to be the closer. Rarely do lawyers give up their argument time, especially in a case like this. But we all saw one advantage. My brief addressed the Constitutional aspects of the right to sue religions for torts but more importantly, I was the one who had brought the brainwashing issue into the public arena fighting Synanon—I was the one who got the rattlesnake for doing it. That had been a big national news story for over five years. I would be the object of their curiosity. The Justices would want to judge me for themselves, what I had been doing–was it right or wrong? And so the Justices agreed I could do the rebuttal for both Leal and Molko, although also a unique move, possibly without precedent. Packing bags usually identifies with the adventure of vacation, not dread. There would be 2 times in my life when in packing bags I felt both fear and bad expectations. Once was when I was going to fly to Visalia to take Charles Dederich’s deposition after he had been convicted of conspiracy to murder me. The second was when preparing to leave my wife and almost 4 son for a hotel room in San Francisco where the next day we would appear to orally argue Molko. Sleep was hard that night. Given the Katz dictum and the stature of Judge Ira Brown, Jr. I was not confident we would win. I was also worried that the record was unclear with Molko and Leal in explaining they stayed for personal reasons rather than unequivocally stating these reasons were what they were brainwashed to believe. As I said, Ford took this issue on. But I wasn’t there so much as for plaintiffs as I was the public; if it was going against us I would try to get in the opinion enough verbiage to distinguish it away from a better factual record re testimony as to why they stayed. In other words, if the case was lost, to salvage what we could. In my brief I had even given the Supreme Court in out if it did not want to rule on the First Amendment issues at all and save it for another day. I said those issues did not have to be reached this day since it was admitted that the church concealed their religious identity and by such denial of same they were estopped to assert religious First Amendment rights. In other words, by denying the were a religious organization in this limited fact situation they had waived the right to claim religious freedom they say there are entitled to. If that idea was not bought, I thought, this might be the low point of my life. Ford was not optimistic either. We had dinner together but were not smiling. But what would occur was one of the most exhilarating experiences I ever had. I argued before in the appellate courts, but there is something majestic and unequally honorable in the Supreme Court. Lawyers were announced by name and asked to step forward to their seats like knights of the round table. The Justices, sat like Kings, high up before us. I felt so very proud to be there. Added to that was the atmosphere this was a special case where history would be made. Everywhere were television cameras and reporters ready to take down every word . And by the time Ford was half-way through we were smiling. An appellate argument differs from trial court. Despite your limited time, Justices generally interrupted you and asked challenging questions. Often by the questions they asked you could tell which way they were thinking. Not only were the right questions being asked of Ford it was the churches lawyers who had their arguments grilled. By the time I stood up to the plate, no home run was needed. It was mine to lose. All I really had to do was say yes to the questions asked. But I did close saying with tort liability established organizations (don’t think we used the “cult” word) will be discouraged from continuing brainwashing camps like Boonville as it could cost them big money judgments and money was what they were about. At the same time, knowing the practice had been discouraged, parents may be more confident in their children’s religious choices and the need for kidnapping/deprogramming may vanish. Finally, in October of l988, while my son still to young to understand his Dad’s exuberance, the High Court issued its formal ruling. The state, it said, has a compelling interest in protecting not just religions but the family institution. Since the family almost invariably suffers great stress and sometimes incurs significant financial loss when one of its members is unknowingly subjected to coercive persuasion the state has a compelling duty to protect families from suffering such impairments as a result of fraud and deception. The Justices understood Molko and Leal admissiion’s; they were aware of the Church’s identity at the time they formally joined had to be taken in context with the claim that by the time the Church disclosed its true identity, the Church’s agents had rendered them incapable of deciding not to join the Church, by subjecting them, without their knowledge or consent, to an intense program of coercive persuasion. “The brainwashing concept is controversial. Some highly respected authorities conclude brainwashing exists and is remarkably effective. (See, e.g., Lifton, Thought Reform and the Psychology of Totalism (1961); Schein, Coercive Persuasion (1961).) Some commentators additionally conclude that certain religious groups use brainwashing techniques to recruit and control members. (See, e.g., Delgado, Religious Totalism: Gentle and Ungentle Persuasion Under the First Amendment (1977) 51 So.Cal.L.Rev. The court further found brainwashing supported a claim of intentional infliction of emotional distress as it is outrageous conduct which iit defined as “exceeds all bounds of decency usually tolerated by a decent society, and is of a nature which is especially calculated to cause, and does cause, mental distress. . .
“…The Church’s continued deceptions might well be seen as conduct breaching plaintiffs’ trust in the integrity of those who were promising to make their lives more meaningful. Based on coerced beliefs the court said plaintiffs could seek their financial contributions back. The Justices did make one mistake, indicating perhaps in the end they did not completely get it. They ruled the claim of false imprisonment was improper. A person is falsely imprisoned “if he is wrongfully deprived of his freedom to leave a particular place by the conduct of another.” Leal said she was imprisoned by belief if she left that harm, specifically, that her family “would be damned in Hell” and she would lose her ticket to heaven. It was ruled her theory implicates the Church’s beliefs by seeking to make the Church liable for threatening divine retribution. Such threats are protected religious speech. In so ruling, the Justices contradicted the rest of their decision. There was no claim it was wrong to teach such beliefs, or whether there were valid or not, but that the fraud induced them into an environment where such belief was installed through coercive persuasion. If it is okay to sue for fraud and brainwashing to making you believe something from which you donated gifts based upon those beliefs, then it follows that there is liability for false imprisonment based upon fraudulent and forcibly induced beliefs in Divine Retribution. Somehow, the Justices on that issue failed to connect all the same dots they had in the other causes of action. Ford Greene went on to fight one crusade after another. Both of us, he up North, and me down South, would be tagged “the cult buster.” He next took on the Church of Scientology and together we tried to get the courts to unseal Scientology’s OT3 secrets, arguing the public should know the ultimate theory of rebellion leaders blown up in volcanoes and their thetans (souls) attaching to new born babies (L.Ron Hubbard, after all, was a science fiction writer). Later OT3 not only became publicly known but was spoofed in an infamous South Park episode that has John Travolta and Tom Cruise asked to come out of a closet. Greene was back in the spotlight not long ago for posting a large political sign on the side of his office building along Sir Francis Drake Boulevard. Commuters can’t miss it and Ford filled it with anti Bush, anti- Iraq war and even once, like a child of the 60’s, hung the American flag upside-down. It resulted in town of San Anselmo filing a lawsuit but Ford kept going like the energy rabbit. On December 14, 2010 he became voted the new mayor of San Anselmo thus ending the fight. After the Molko decision I wrote Rosedale a letter. I don’t remember much of it but the intent was not kind. I think I asked him if he recognized all the citations in the Molko Supreme Court opinion that came from my brief and had he considered what might have happened if Henrietta Crampton on behalf of CFF had not sponsored the brief he tried to replace in a case he knew nothing about. I am sure I called him arrogant and probably used a bad word or two. I probably said something about his ego wanting his name replacing mine after 2 and ½ months work. And I probably closed saying that despite him thank God we won. Rosedale died in November 4, 2004 and it was said he was one of America’s foremost anti-cult activists. Director of the AFF (renamed ICSA), he worked closely with Michael Langone to assert belief of “cults” as manipulative, organizations harming vulnerable targets. I have no doubt he made many contributions. During his 20 years on the Superior Court bench, Judge Ira Brown, Jr. ruled over an asbestos producers and their insurers litigation, one of the biggest in U.S. history. It was tried for 2 years in a school auditorium, with more than 100 lawyers sitting at 26 tables. Brown ruled in 1987 the insurance carriers had to pay billions for thousands of claims the fiber caused cancer. Judge Brown retired in 1991 and died of diabetes at the turn of the century. Henrietta Crampton, one of the founders of the first anti cult movements in America, and who in sticking by me got my brief filed in Molko and myself at oral argument, ultimately died from stomach cancer. Stanley Leal remains a respected trial attorney for nearly 50 years and was past president of the California Trial Lawyers Association and Santa Clara County Bar Association. He is survived by twins Todd and Tracy Leal; son Matt R. Leal, Esq. ; and a grandson. Robert Philibosian was picked to replace John Van de Kamp after his election as state attorney general in 1982. He had been a deputy district attorney, an active courtroom prosecutor from 1968 to 1979. Later he served as chief deputy attorney general. His career since has not caught my attention. As to Cult Awareness Network (CAN), which at Rosedale’s orders dumped my brief, it’s fate was not envious. From 1978 until 1996 the Cult Awareness Network served the public stockpiling information on various groups it called destructive which it would release on inquiry. I don’ know their definition of “destructive” but I called the ones of my concern “malignant” and defined it as where the individual lives to serve the group rather than the group formed to assist the individual. However, Dr. Lifton had written that polarized attacks by these groups cause reverse polarization in its victims often producing the same ends justify the means mentalities on both sides. Leaders and members of anti-cult groups often were people who had suffered through coerced membership, coerced membership of a loved one or some act of retaliation for having been a critic. As a group they could, and some did, develop cultic tendencies themselves. I chose never to be a member of something I could not control, or even know what it was doing, so I turned down CAN invites to be on board, as well as other so called anti-cult groups. And I certainly did not want my name linked to any kidnapping/deprogramming even though I appreciated why some parents resulted to such means. I didn’t want to be involved where I could be brought into a lawsuit as a defendant for something I didn’t know of or approve of. So I limited my assistance to legal advice when asked and to speaking engagements. I, too, back then, if asked, usually called Scientology the group of most concern given its wealth and history of its guardian office plans to disrupt the lives of those perceived to be their critics. L. Ron Hubbard memos circulated saying an organization or person could be destroyed by lawsuits even before you get to trial by running up its cost, that enemies are fair game for ruination and one memo R2-45 is about putting a gun to a head. Some say Scientology led to the Anti-SLAPP laws (procedures to terminate early retaliation suits for exercise of free speech. Synanon board of director minutes referenced guidance from the Scientology notorious Gaurdian’s Office in the 70’s. Scientology was also said to have been a moving force behind APRL, a short lived alliance of groups many targeted as destructive. Often groups mutate to a more benign state following their founder’s death, its predecessors seeing less importance at being at war, but Hubbard’s memos still echo. I had also seen Moxon and Bowles practice of taking depositions of same people over and over again in different Scientologist cases. They did to this to Jim Siegelman and Floy Conway, authors of Snapping, it appearing to me as if it was all to punish them. I prepared them and appeared for them pro bono in one case in Los Angeles. CAN was driven into bankruptcy when a court found CAN guilty of having conspired to violate the civil rights and religious liberties of Jason Scott, a Pentecostalist, who had been forcibly kidnapped and subjected to a failed “deprogramming” by Rick Ross, a CAN-referred deprogrammer. Ross is someone I have talked to, runs a good information site, but my asking to be removed from his board list long ago as I served no real role and was against kidnappings never sat well with him as I did not want my name attached to something I might not support. The court ordered CAN to pay $1 million, a victory for Church of Scientology attorney Ken Moxon. I knew Moxon well. In contrast to his partner, Terry Bowles, Moxon could get outwardly fanatic. Once he came out of court screaming at me about some case I knew nothing about but he assumed I must have been behind it. It led us to a nose-to-nose confrontation. I remembered trying to stay in control; my stand was always anti violence and it was to Scientology’s advantage to have me take a swing. I know I had feelings of wanting to. I hate false accusations. Fortunately, two Scientology body guards stepped in between us showing good judgment. A little later, I was told another attorney Moxon tried to irritate did level him with a punch. Moxon, to his credit, I thought, I heard chose to do nothing about it. Kent Richland, who long ago used my assistance to remove Judge Noel Cannon from the bench (See Pink Justice) and his firm Greines, Martin, Stein & Richland put on a national panel to discuss First Amendment and Torts after the Molko decision. Bowles and Moxon got up and gave propaganda speeches that lawsuits against churches were brought by bigoted religious haters. But freedom of religion would prevail. When it was my turn to speak I apologized to all those who flew out for the panel having to listen to such dribble rather than legal contentions of what could be sued for and what could not. I then said I was probably one of the bigoted religious haters they were referring to; then I listed my cases asking if it sounded like I had good cause or not—kidnappings, imprisonment, child abuse, sexual misconduct, beatings and attempted murder. As to the law they came to learn, I referred them to a paper I wrote for the event. CAN was bought in bankruptcy by Church of Scientology attorney Steven Hayes in 1996. As a result of a legal settlement with Landmark Education, it has been reported, CAN agreed not to sell copies of Outrageous Betrayal, a book critical of Werner Erhard, for five years after it emerged from bankruptcy proceedings. Following its bankruptcy, the files of the “Old CAN” were made available to scholars for study and transferred to a university library. Whatever I wrote to and from CAN was now apparently in Scientology hands. Moxon and later others have stated that the “Old CAN” covertly continued to make and derive income from referrals to coercive deprogrammers, while publicly distancing itself from the practice. If true in any part, my decision not to be part of anti-cult groups because they might support kidnappings or something I would not approve of, turned out to be wise. I supported Exit Counseling when a former member wanted it. After the Molko decision I called attorney Charles O’Reilly who had won a large multi-million verdict against Scientology for his client Larry Wollersheim which was on appeal. On of Wollersheim’s claims was Scientology had Scientologitsts “shun” his business for leaving Scientology. There was an old case, Bear v. Reformed Mennonite Church (1975) 462 Pa. 330 which approved a lawsuit for shunning. I told Charlie I cited Bear in my Molko brief and the Supreme Court cited Bear in the Molko decisions with approval so he should use it in his appeal. He did and Wollersheim won. But the battle went on for 20 years before Scientology settled paying 8.7 million in 2002, much of it going to a multitude of lawyers. Charlie, who I had wanted to represent me against Synanon, but didn’t return phone calls in time, passed this year. In 1993, Wollersheim co-founded Fight Against Coercive Tactics Network (FACT Net or F.A.C.T.Net) which is an on line information resource on cults. FACTNet, per Wikipedia, was soon involved in its own legal battles with Scientology. But it had been reported that by 2002 Moon had spente nearly $2 billion on the Times. The paper, once read every day by Ronald Reagan at the White House, dwindled over time in staff, coverage and readers. In his 2004 book The Republican Noise Machine, journalist Dave Brock wrote “the Washington Times was governed by a calculatedly unfair political bias” and that its journalistic ethics were “close to nil. On November 2, 2010, Rev. Moon, now in his 90’s and a group of former Washington Times editors purchased the paper from Moon’s son, Preston Moon, for $1 ending a consideration to close down the newspaper. fn1 The Illinois Supreme Court, per Wikipedia, noted CAN’s claim that the defendants conspired with each other to maliciously conduct a campaign of repeated prosecutions for the express purpose of causing CAN’s bankruptcy and eventual disbandment. Specifically between January 24, 1992, and July 1, 1993, various members of the Church of Scientology filed 21 lawsuits around the United States which named authentic CAN as the defendant. Each complaint (based on a denial of membership in CAN when members of Scientology attempted disruption by infiltration) was the same in 20 of the 21 cases and resulted in courts in Illinois, California, Massachusetts, Minnesota, New York, and Washington, D.C. dismissing or finding in CAN’s favor in each case. The Illinois Supreme Court noted CAN’s claim that the Church of Scientology instituted the simultaneous suits, not to resolve any legal dispute between the parties, but to keep plaintiff from engaging in its business of disseminating information regarding religious freedom.